N 37° 26' 58" and E 46° 15' 53"
Qeshlāq in East Azerbaijan is a town located in Iran about 311 mi (or 500 km) west of Tehran, the country's capital place. Time in Qeshlāq is now 02:03 AM (Monday). The local timezone is named Asia / Tehran with an UTC offset of 4.5 hours. We know of 8 airports nearby Qeshlāq, of which one is a larger airport. The closest airport in Iran is Sahand Airport in a distance of 10 mi (or 17 km), South-West. Besides the airports, there are other travel options available (check left side). There are several Unesco world heritage sites nearby. 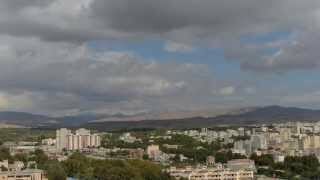 The closest heritage site in Iran is Tabriz Historic Bazaar Complex in a distance of 44 mi (or 70 km), North. Being here already, you might want to pay a visit to some of the following locations: Maragheh, Bonab, Malekan, `Ajab Shir and Azarshahr. To further explore this place, just scroll down and browse the available info. Let's start with some photos from the area. Snow, light breeze, broken clouds. Maragheh observatory was an institutionalized astronomical observatory which was established in 1259 CE under the patronage of the Ilkhanid Hulagu and the directorship of Nasir al-Din al-Tusi, an Iranian scientist and astronomer. Located in the heights west of Maragheh, East Azerbaijan Province, Iran, it was once considered one of the most prestigious observatories in the world. Located at 37.3961, 46.2092 (Lat. / Lng. ), about 5 miles away. Sahand Airport is an airport in Marageh, Iran. Located at 37.348, 46.1279 (Lat. / Lng. ), about 10 miles away. These are some bigger and more relevant cities in the wider vivinity of Qeshlāq.